I recently experienced 2.5 days doing of joint training with The Art of Hosting and Waterlution called the Water Dialogues. The training was a combination of learning and experiencing. What do I mean? There were a few sessions dedicated to explaining the underpinnings of the philosophies however most of our time was spent experiencing the art and reflecting as a group and on our own. Most people really appreciated this. 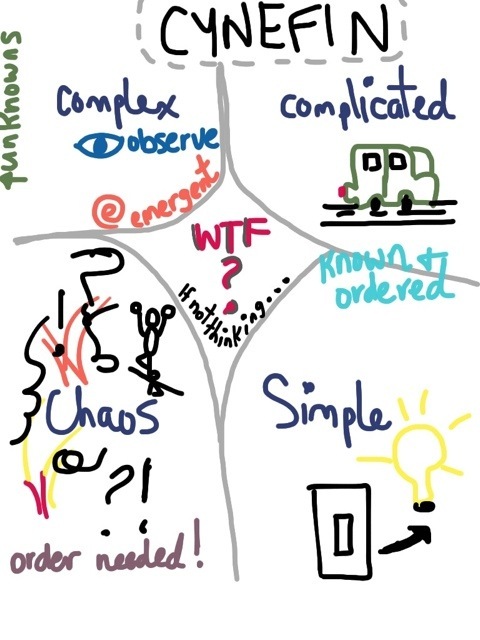 Chris Corrigan , one of the hosts, introduced the Cynefin framework (used by Cognitive Edge) as a way to differentiate between simple, complicated and complex problems. It’s important to understand what you are working with in order to choose the best methods to address each challenge, project or process one enters. 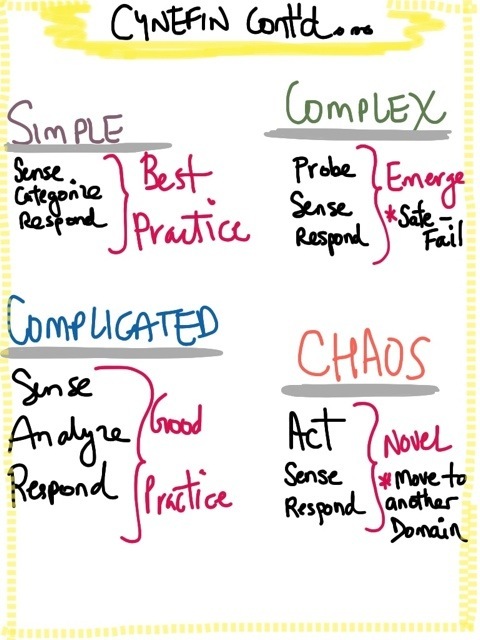 I have taken the cognitive edge training (2007) and appreciated the way it was introduced as a sense-making framework. One thing to add to Chris’ very good explanation is that this framework can also help ensure the appropriate evaluation method is used. For example, complex projects work with well with developmental evaluation approaches as opposed to traditional log frames. The four fold practice was introduced as a way to check in with yourself and see where you are at. It was noted that it’s important to work on all areas to embrace a well rounded practice (key word is practice). 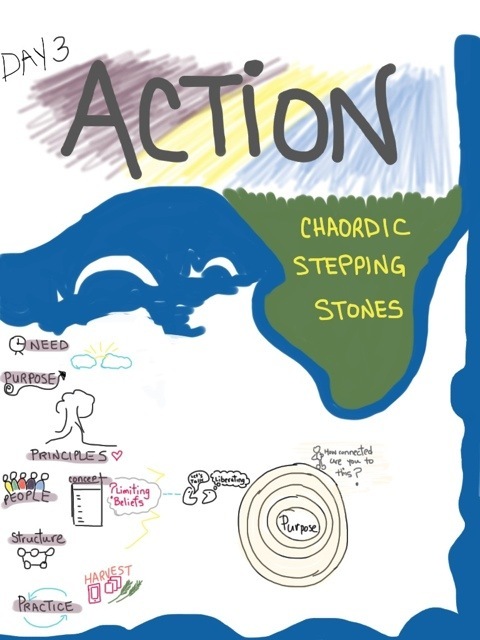 The Chaordic Stepping Stones are another way to approach work, ensuring you have a solid based to work from – pay attention to need and purpose first moving to structure only when the first few stones are really in place! This could be a challenge with clients as they are always jumping to what it might look like in action (the process/engagement) however reinforcing the need and purpose are good first steps to designing an appropriate purpose. I also took home the message that Intent is very important in all that we do, i.e. consider what your doing, why your doing it, for whom, etc. This seems obvious but taking time to reflect on the process and actions isn’t always a part of our work rituals …and it should be. The weekend brought together a mix of professionals working in the world of water and passionate about contributing to positive change. The opportunity to listen to the diversity of interests and projects was interesting for me as I tend to get wrapped up in my own world of work and interests. There was sufficient time to meet and check in with the participants and hosts which was probably one of the most important aspects. 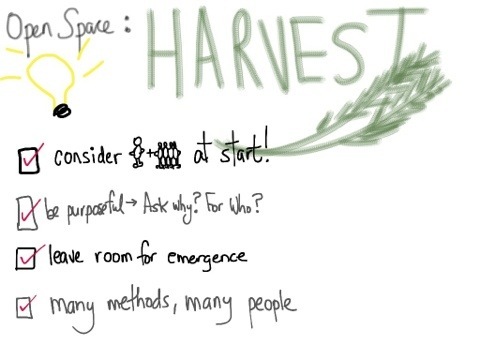 I went to a couple open space sessions on harvesting. One about the relevance of harvests and the other about sustaining the harvest over space and time. 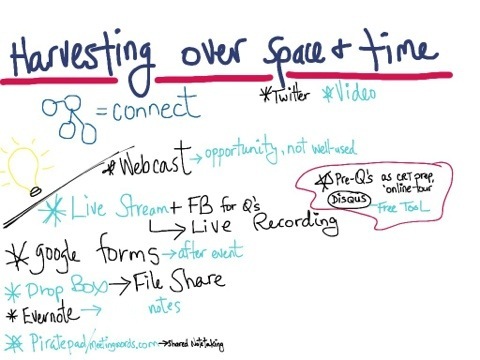 The latter evolved into a discussion about engaging and communicating over space and time which I view as different than a harvest per se however there is room for debate in a lot of these concepts. I did come away with an idea and free tool for a project I’m working on this spring and I am thankful for the small gem. Generally speaking, thinking about what you want to get out of the meeting in advance, in terms of both learning, artifacts to share and any reporting required, should be done at the outset of your process. This is another good reminder that planning takes time and is involved (so embed that into your work plan, timelines and budget). In summary, I was fascinated by the rawness people brought forth, sometimes depressing but towards the end, a renewed energy and sense of joy emerged. I feel hopeful by this change in energy, not to mention inspired by the excitement some folks shared after a great conversation, an evening of live music or a moment watching dolphins enter the bay. Personally I used this time to practice on my iPad (a small goal I rarely find time to work on) and that was quite fun! I also enjoyed the opportunity to simply be present and practice the art. Thanks to everyone who partook on Bowen Island – I hope we have the opportunity to meet again and share some conversation.